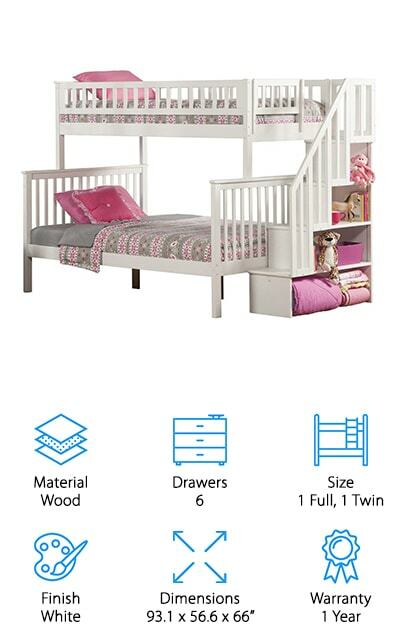 Growing up we all wanted the perfect bunk beds to share with our sister or brother, but for our parents and parents like you, finding a safe bunk bed with stairs was more challenging than the movies always made it seem. 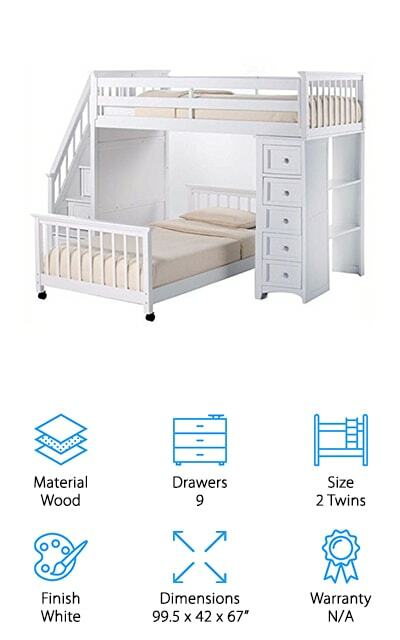 We decided to take it upon ourselves to find the best bunk beds with stairs for kids to keep you from staying up all night, wondering who will fall out of the bed next. If you’re ready to sleep soundly, keep reading as we show you our top picks for bunk beds! Finding the best bunk bed isn’t just about how it looks. There are a few other factors to consider when you finally cave in and give your kiddos what they want. Be sure to look for these qualities before you buy to ensure your kids have everything they need including storage, space, and safety! No need to hit the snooze, let’s go! Material: Two of the sturdiest materials to look for are wood and metal. These materials are perfect for the inevitable rough-housing, but also look good in almost any setting. Find a material that gives you both peace of mind and a great outward appearance. Drawers: Storage space is key. Putting a bunk bed in can sometimes mean you’re giving up other space. Drawers are great for storing clothes and toys, so if you have a surplus of those items and insufficient space, look for a drawer or two! Size: Finding the perfect size can often be a task as your kids may not be the same age or size. Depending on their stage of life, you will need to find a bed size that will last them for at least a few years. Finish: The finish or color of the bunk beds can be a big factor. If you’re looking for a bunk bed system that meshes with decor you’ve already chosen, be sure to check the finish or color before purchase! Dimensions: Not all bunk beds will fit in your space. The dimensions of the bunk beds should be able to fit in your child’s room without taking up every inch of it. Find a bunk bed that will fit perfectly without giving up the entire floor. Warranty: The last thing you want is a faulty bunk bed. Double check the warranty to see what is covered and what’s not before purchase to ensure that your new beds will be replaced or your money back! Now that you know everything you need to know about bunk beds, it’s time we shared our top 10 picks with you! Our top pick and budget pick represent our very favorite bunk beds, but we also have a collection of other bunk beds that we couldn’t turn down. If you’re ready to jump into bed with a bunk bed, we’ve got you covered! Our top pick comes from Bedz King! This bunk bed has everything you need for the ultimate bunk bed setup. Made with solid Brazilian pine, this bunk bed has a full set of stairs with a handrail to keep your kids safe as they climb to the very top. The finish over the wood is child safe, so you won’t have MDF or particle board pieces chip off. Every stair comes with its own drawer and you’ll find an additional set of drawers underneath the full sized bed for all the storage you could ask for. The top bed area is for a twin sized mattress while the lower level is for a full sized bed. This bunk bed set does not include the mattresses, but you’ll find everything you need to set it up inside the box. If you’re looking for the best bunk bed, we think the Bedz King Stairway Bunk Bed is the best choice! The South Shore Mobby Loft Bed is the perfect budget pick as it has everything your child wants in a sleek finish. The bed area is twin sized, but you’ll find a shelf at the head of the bed and under the stairs. Even though this bed is made out of particle board, it’s made out of the non-toxic kind so it is safe for your child. You’ll find that the bed itself is easy to set up but it will require two adults to put it together! The best thing about this bed is that it offers a few different ways to customize the way it looks, so you can make this bunk bed fit anywhere in your space. If you choose to get a second bed, you can roll another twin sized bed underneath it. If you’re shopping for a bunk bed on a budget, the South Shore Mobby Loft Bed is a great option. Looking for three beds in one? Take a peek at the Atlantic Furniture Columbia Bunk Bed. 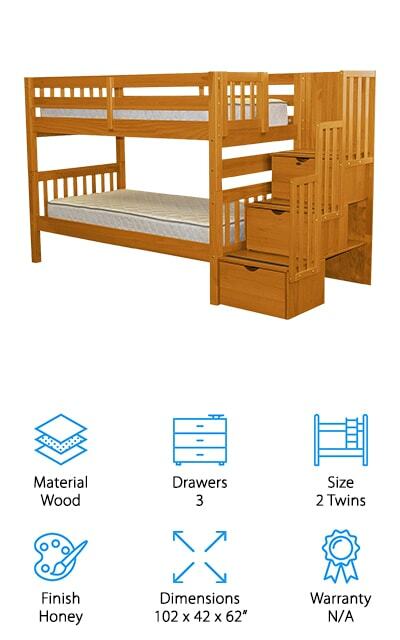 Made from eco-friendly hardwood, this bunk bed setup is sturdy enough for your kids. The five-step finish will keep your bunk beds safe for years to come. Steel reinforcements are also in place to give the bed extra strength. 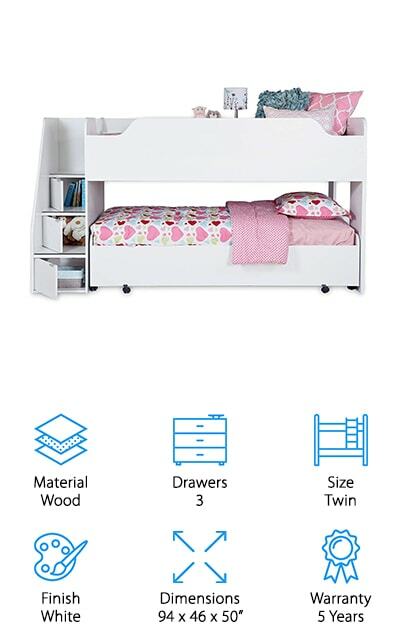 This fun bunk bed has three twin sized bed areas: one at the top, one on the lower level, and an additional trundle bed that pulls out via the big drawer. The staircase can be setup on either end of the bed, giving you the option to customize how you setup the room. You will have to assemble the bed yourself, but for the ultimate bunk bed and additional storage it will all be worth the work! If your home has three kids or hosts the neighborhood sleepovers, Atlantic Furniture’s Columbia Bunk Bed takes the cake. 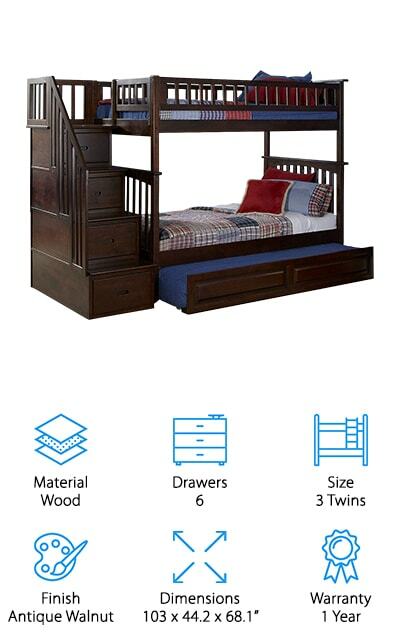 The ACME Jason Bunk Bed is a lot like the Atlantic Furniture Bunk Bed as it offers two standard beds and a trundle bed. The main difference is that the lower level bed is a full sized bed. Both the trundle and top bed are twin sized as you would expect. The espresso finish gives the bunk beds a nice touch, but the best benefit of this bed is that the drawers are located at the end of the stairs. With the stairs at the end, you can pull the drawers out as far as you’d like without getting caught up on the stairs like other bunk beds. This bed itself is made out of pine and MDF making them sturdy enough for the few years that your kids share a room. The trundle bed fits a mattress up to 7 inches. Although this set does not include mattresses, you’ll be happy you took a look at ACME’s Jason Bunk Bed! The Bedz King Twin Over Twin Bed comes in a great honey color that will brighten up any room! It comes with three drawers for storage and two twin sized bed areas. Made with Brazilian pine and a child-safe finish, this bed is perfect for kids. It’s easy to set up as it comes with slats to lay the mattresses on. You have the option to attach the stairs at either end of the bed to find the perfect fit in your room. The weight capacity for the top bed is 175 pounds while the lower level bed holds up to 200 pounds. With two people to assemble the beds, you’ll only spend a few hours of your day setting these bunk beds up. This bunk bed set doesn’t come with mattresses, so you’ll have to buy your own, but if you’re looking for a simple, sturdy bunk bed setup for your kids these beds are a great investment. The Plank & Beam Staircase Loft Bed is made from New Zealand pine and hand finished with a white coat. This setup includes two beds, one on top and another in the middle of the bottom. Though the two beds aren’t connected, the bottom bed slips in between the two dressers keeping the lower level bed in one place. The dressers are sold in this setup, but you can easily take them out or rearrange them to fit your space. You have a total of 11 drawers, three in the stairs and 8 combined in both dressers. 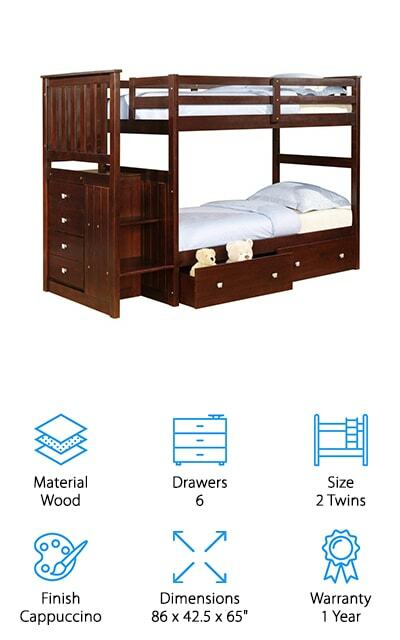 Plank & Beam built this bunk bed to last and to keep your children safe. The internal metal connectors and structures hold up to 400 pounds, so any bouncing or rough housing won’t break the bed. The 14-inch railing on the side of the stairs gives your child a safe space to crawl up to the top bunk without fear of falling. If you’re looking for a bunk bed with the most amount of storage, get yourself a Plank & Beam Staircase Loft Bed! 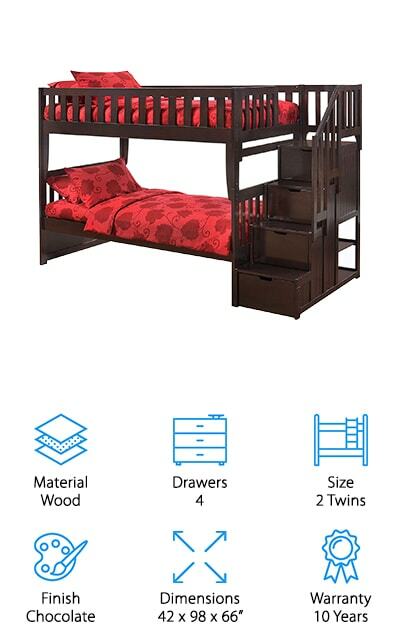 The Donco Cappuccino Mission Bunk Bed is a lot like the classic camp bunk beds we all know and love. Constructed out of solid wood, this bunk bed setup is sturdy enough to handle two kids and assembles together all in one piece. Each bed is twin sized. 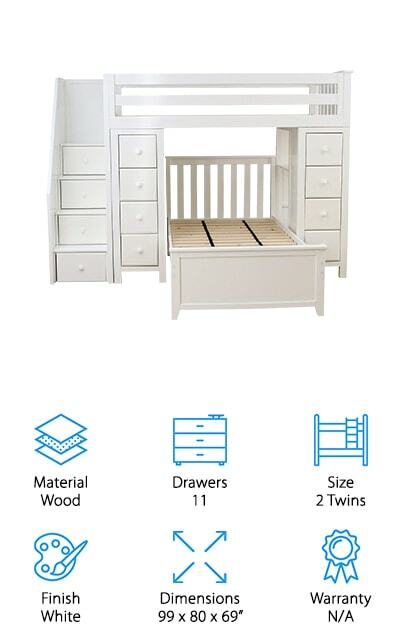 With six drawers, you’ll have plenty of storage for books, toys, and clothes. The stairs themselves are reversible, but also have a ladder-look for those who don’t want bulky stairs. Each set up comes with everything you need to assemble your own bunk beds, but you also have the option to have a professional install it for you for only a few extra dollars. Mattresses are not included, but an 8 inch thick mattress fits perfectly in both bed areas. If you’re looking for a more classic take on bunk beds, check out Donco’s Cappuccino Mission Bunk Bed for a safe and sturdy set up! The Night and Day Furniture Bunk Bed is truly a piece that works for both your night and day needs. With four drawers, you can store any toys, books, or clothes easily. The stairs can be setup on either side of the bed and additional accessories are available for purchase, too. You can add a trundle bed to slide underneath the lower level or buy extra rolling drawers, too. There’s an added bonus, too! You’ll find two shelves on the back of the bunk beds to give you a few extra spots to store items that don’t fit anywhere else. The chocolate finish gives these bunk beds a sleek feel. It’ll be easy to mix and match colors with it, too! 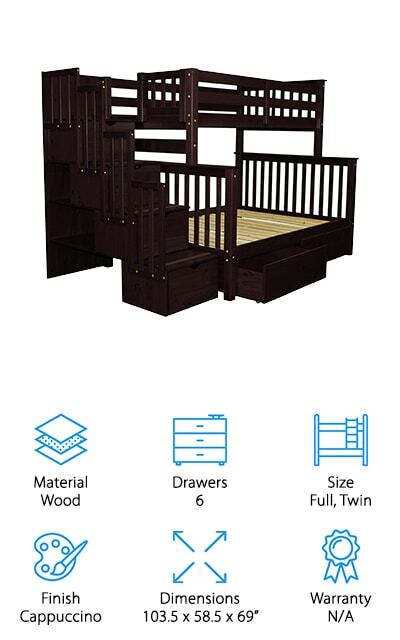 With quality construction and comfort, this setup is a great choice for your kids. 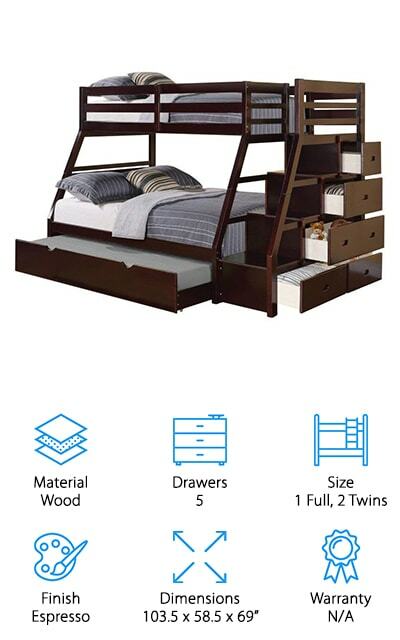 If you’re looking for a chocolate colored bunk bed, the Night & Day Furniture Bunk Bed is your go-to bunk bed! Just like the first Atlantic Furniture bunk bed, their Woodland Bunk Bed is made from eco-friendly hardwood with a five-step finish. With both twin size and full size beds, this bed is great for kids and adults. Both bed areas fit a 9.5 inch thick mattress and can be split up into two separate beds. The staircase can also be setup on either end, giving you simple customization. Assembly is required, but in a few quick hours, you’ll have a set of your very own bunk beds perfect for your kids’ room or a vacation house! A slat system is included to keep your mattresses from falling in, and steel reinforcements keep the bed together for years to come. If your bed breaks or malfunctions at any point, it comes with a one year manufacturer’s warranty so you can get a replacement or the parts you need to fix it. If you’re looking for a full size bunk bed, Atlantic Furniture’s twin and full sized beds are a great compromise! If your child is a bookworm, the Pemberly Row Stair Loft Bed is a great choice. With a ton of storage, nine drawers, this bed also comes with 2 bookshelves! The bunk beds are made of hardwood and veneer for a very sturdy build. The top level bed accommodates an 8 inch thick mattress and an additional bed can fit under the top level between the drawers and stairs. There’s a desk option, too, that could be useful for doing homework or studying. Once you receive your bunk bed, the box will contain slats for the bed, all the parts needed to build the drawers and bookshelves, as well as the stairs. You’ll definitely need two people to set up this bed, but the amenities it provides will make all the hard labor worth it! For the studious kids out there looking for the best bunk bed, the Pemberly Row Stair Loft Bed is the only choice!